We have helped plan many trips to Thailand. We also get a lot of questions from people who are planning their two weeks in Thailand. In the spirit of saving a little time and sharing, we thought we would write our suggestions on how to best spend two weeks in Thailand. Thailand is a long flight from the western world and two weeks in Thailand is a great amount of time to experience some of what this great country has to offer. Thailand is a beautiful and wonderful place that has options for everyone. There are so many things to do in Thailand you’ll want at least two weeks. There’s no single city you have to base yourself out of, and with so many fantastic options, you will need to do a multi-city trip. A logical place to start your tour of Thailand is the main hub of the region, and the country’s capital, Bangkok. 3 days in Bangkok is the right amount of time for most people to explore, eat, and take in the sights. Make sure to find the ornately decorated Grand Palace and the beautiful Wat Pho. At night, explore the lively Sukhumvit area of town or head to Khao San Road for a taste of Bangkok’s international party scene. For a full list of activities and a detailed itinerary check out our 3 days in Bangkok guide. Bangkok Airbnb’s are a great alternative to a hotel and cheaper. Stay in a high rise luxury condo or rent an entire house! Airbnb first-timers, if you sign up through my referral link you get $40 credit when you book your first trip! –>> sign up here! After the hustle and bustle of Bangkok, hop on a quick flight down south to relax on some of the world’s most beautiful beaches. Thailand has over 300 islands and you are sure to find a few to your liking. We recommend spending a week on the beaches to relax and explore this varied and beautiful aspect of Thailand. Most islands take about a day’s travel from the mainland so plan accordingly when outlining your two weeks in Thailand. A few islands will have airports, making travel quicker and easier. But, generally speaking, the harder the island is to get to, the less crowded and more beautiful it will be. As tempting as it may be to try and see as many islands as possible during your two weeks in Thailand, try and stick to just one or two. Pushing to fulfill a schedule will end up eating into your time and enjoyment of your trip. Below is a list of our favorite islands and what to expect from each to help you narrow down where you want to spend your time. Made famous from the 1990’s movie ‘The Beach’, the island is next to the movie’s filming location. The island itself has white sand beaches surrounded by high limestone cliffs. The setting is idyllic, however, the current situation on the island is not. Over the years, Koh Phi Phi has turned into a crowded party island. There is only a thin strip of land where the majority of hotel, restaurants, and bars are located. The island’s large draw and limited space can be a let down if you are expecting the undiscovered beach from the movie. However, it’s still a beautiful place as long as you know what you are signing up for. To get to Koh Phi Phi take a flight from Thailand to Phuket or Krabi, and then a ferry from there. For a less visited, and possibly the most beautiful island in Thailand, head way down south for crystal clear waters of Koh Lipe. The island is one of our favorite places in the world to date. Koh Lipe is just the right combination for us with its tasty Thai food, great beaches, and fewer people. Head over to Koh Adang and hike up to the viewpoint for an amazing view of Koh Lipe. It is more difficult to get to, but it is still reachable in one day. Daily flights connect to Pak Bara in the south where ferries are available to the island. If you are looking for another island to tie into your Thai Island hopping, it’s best to head to Koh Lanta, the next closest island in the Andaman sea. Best for: Travelers 25 and up. There is not a huge party scene on the island, there are many bars, but it’s a quieter island and only a handful will be open past 11 pm. What to expect: Koh Lipe is not a backpacker island. It’s gaining in popularity and is targeting the mid-range market with many small boutique hotels. There are conservation efforts in place to keep the beaches clean and they seem to be working. Don’t Miss: Sunset/sunrise from the beach it’s free and stunning almost every day. Excellent southern Thai dishes and seafood. Stonehenge the best dive site in Koh Lipe. In general, I would avoid beach towns on the mainland or large islands like Phuket. Some can be great, but overall, the smaller islands are prettier and less crowded. For more on Koh Lipe make sure to check out our Koh Lipe Ultimate Guide. Step away from the beach and head north for a look into Thai culture. Visit the ancient 800-year-old city of Chiang Mai. Home to over 300 temples, we’ve trimmed it down to our top 10 temples in Chiang Mai. Known as the Culture Capital of the North, Chiang Mai holds within its crumbling brick walls temples that date back to the 1200s. The city of Chiang Mai is markedly different than the rest of Thailand. Chaing Mai has a good mix of new and old while having a very trendy, university city, vibe. It’s a must for any trip and a great stop for two weeks in Thailand. There are a ton of things to do in Chiang Mai you’ll be glad to have a least 4 days in Northern Thailand. We’ve lived in Chiang Mai on and off for over 3 years. It is our home away from home, living in Chiang Mai is just like being at home. We’ve spent Christmas in Thailand three times and two of those were in Chiang Mai. This past Christmas we got Christmas gifts that will last a lifetime, we both got Sak Yant tattoos to protect us while traveling. Yes, we got tattooed by a monk in Thailand! For the craziest and wettest festival plan your visit so you’ll be in Chiang Mai to ring in the Thai New Year where the Songkran Chiang Mai festival is in full effect. Every April 13-15th the city turns into the world’s largest squirt gun fight! Food in the north is different than the southern dishes found on the beaches. Make sure to sample widely! Don’t Miss: The weekend night markets on Saturday and Sunday nights. Try the Northern Thai favorites like Essan sausages spiced with lemongrass and chilies, Khao Soi a spicy soup with crispy fried noodles, and much more. Be sure to take a trip up to the famous Doi Su Thep Temple on the hill overlooking the Chiang Mai. If you visit in November, try and line your dates up with the Yee Ping festival aka Chiang Mai lantern festival. An alternative to Chiang Mai would be to head over to one of Thailand’s former capitals, Sukothai to see the amazing temples and statues of Sukhothai. Have you been to Thailand? Did you spend more than or less than two weeks in Thailand? We are planning on taking our honeymoon to Thailand in 2019 and this guide seems perfect! However our wedding is at the end of May, and we would like to go on the honeymoon right after, which would be right at the beginning of the rainy season. How big of a deal is that, would it be fine to follow a similar itinerary as this or would it be better to wait until a different time? Hey James – I don’t think that is a deal breaker for me – rainy season in Thailand doesn’t mean it’s going to rain all day every day. You can expect 1-2 hours of rain most days – usually in the afternoon. Sometimes more sometimes less. It will also be low season for travel which has its pros and cons. On the plus side everywhere will be much less busy and the prices lower. On the downside, there are fewer transportation options to some islands, but this is generally not a huge problem – just takes more planning. We just traveled in January and just about got rained out while on the islands – which normally shouldn’t happen in Thailand, but weather patterns are changing slightly and even dry seasons around the world can be less predictable. As long as you know that there is a chance for rain in May and plan some activities to fit you should still be able to have a great trip to Thailand. No matter the time of year we like the itinerary outlined here, but make sure it ticks all of your boxes. Happy planning! Hello, I have been planning our trip for several months now and one part yet remains to be a mystery! I have recently stumbled across your blog and love it. My daughter (23) and I will be traveling to Thailand in November we will stay 3 nights in Bangkok and then are going to chiang mai for 5 nights for the lantern festival then we are undecided we have 4 nights left in Thailand before we head to India and are debating between Phuket or Krabi or Koh Lanta? multiple blogs have told me to stay away from Phuket what would you suggest we do and can you recommend a place to stay. We love beaches, snorkeling, relaxing and some adventurous activity. We would like to stay at a nice place that does not take a whole day to get there. I need desperate help want to firm up this week. 3 nights in Bangkok is perfect, make sure to check out our 3 Days in Bangkok guide https://www.gettingstamped.com/3-days-in-bangkok/ and our where to stay in Bangkok guide. Do you know what you want to all do & see in Chiang Mai? I think 5 days is a little much there, we lived in Chiang Mai twice each at 6 months at a time. Also, the lantern festival, do you have tickets to the organized event? If not, I wouldn’t bother going up to Chiang Mai for that. I agree with others avoid Phuket, we never recommend going there. We haven’t been to Koh Lanta so we can’t say, either way, lots of our friends love it. I think Koh Lanta is the best bet out of the 3 islands you listed. We love Koh Lipe thats where we always go. You’ll have a blast wherever you go! Thank you so much for this amazing guide! I will be traveling to Thailand from September 3rd- September 15th. 6 of those days will be dedicated to island hopping. I’ve read that I should avoid the western islands and focus on the gulf islands because of the weather (Koh Phangan, Koh Samui etc.). I’ve also been told that the western islands are more expensive. The things that are most important to me are hidden beaches (want to do lots of snorkeling and boat tours), dramatic scenery, great food, and relatively reasonable prices. We have flights booked to fly into/ out of Surat Thani but nothing else really planned. Any direction you could provide? I would not miss Koh Tao especially if you like diving or snorkeling and the scenery is good too. Make sure you plan properly for Koh Phangan it can get quite full around the full moon, personally, I would avoid this island during the party, it’s a mess. Koh Samui is a big and developed island, so there is less hidden gems here. I would focus on the smaller islands and take day trips from there to see the more unique things. Safe Travels and enjoy Thailand! We are five people close to 30s, not very adventurus i would say. We want to explore the country but also relax as much as possible. We are visiting Thai in August 2018 (12/8-24/8). We have 13 days in total as we arrive in the morning an leave at the evening. I was planning to stay in Bangkok for 3 days (12-14) and then leave for the islands. Stay in Phuket for 4 nights (14-18) and then Krabi for another 3 or four nights (18-22). Then head back to bangkok for the last 2 days and depart from there. I ‘ve read so much about Chiang Mai but i don’t want to rush and waist my days travelling. I would really like to hear your thoughts and recomdations. We love Bangkok and always suggest people spend 3-4 nights in Bangkok especially if it is your first stop on the trip, as you will be jetlagged. Make sure to check out our 3 days in Bangkok and where to stay in Bangkok article. We personally would skip Phuket for sure and maybe stick to Krabi and Koh Lanta instead. Note that you are traveling during monsoon season so the ferries will not be running to the islands and it may be rainy. Another island option would be Koh Samui, Koh Tao, and Koh Phangan (spelt wrong). We have a Thailand island hoping guide you might want to check out and see which island is best for your group. We have lived in Chiang Mai on and off for 2 years, we love the city BUT never did the touristy things. The city is gorgeous and much different than BKK. If you are templed out I would skip it for another time. If you want to go to Elephant Nature Park (the only elephant activity you should do in Thailand is this one it is the only legit one) or want to see the white temple in Chiang Rai. It is a 90 min flight from BKK to Chiang Mai and usually under $40 on Thai, Air Asia, or Smile. Let us know if you have any other questions for traveling Thailand. I am also traveling the same dates as you guys are for your trip to Thailand. Hi! thanks for the great info (I’m still overwhelmed!) We are planning 2 weeks in Thailand in January 2019. After some research and talking with people, we had decided on roughly this same itinerary. We are 3 adventurous 50-something year old girls who love adventure, culture and beauty and we’d like to get a nice sampling of what Thailand has to offer but are looking forward to the islands and beaches the most! We were planning to visit Koh Phi Phi but after reading over the information here, we are now thinking of skipping that island and perhaps heading straight to Koh Lipe. It looks like getting their is a fairly smooth trip from Bangkok. Afterward, we plan to head to Chiang Man for 4 days then home thru Bangkok. My question is…should we fly in and out of Hat Yai? Since we are skipping Koh Phi Phi now, should we include another island destination? or does that complicate things. I like the idea of not spending too much time going from place to place but is 7 days too long on Koh Lipe? Glad you found our website! I would def recommend skipping Koh Phi Phi and head to Koh Lipe instead. Yes, you would fly in and out of Hat Yai. Air Asia offers flight, boat, and airport shuttles to both Chiang Mai and Bangkok. That is the smoothest way to get there. I would then rent a private longtail when you are in Koh Lipe for a day or two, they are usually under 1500 baht a day (under $50 USD). Just go to Sunrise Beach and there is a boat taxi stand and you can talk with the guys there. Let us know if you have any Bangkok,Koh Lipe, or Chiang Mai (we’ve lived here for over a year) questions. Safe travels to Thailand. Hi, your articles and suggestions are so helpful. Unfortunately, my trip is backwards. I’ll be in Bangkok for 4 (11-15)nights then off to Chiang mai for 3 (15-18) nights. Here’s where I’m stuck. I want to island hop but just don’t know where. Koh samui doesn’t seem to have good weather during November. I was thinking maybe somewhere in Phuket and just do island tours? I’m just not sure. Any suggestions. This will be from the November 18-22 of the trip since I have to fly back to Bangkok and catch a flight back home on the 24th. Giving myself some extra time in Bangkok just in case I missed something. November is the end of the rainy season and while there are some lingering storms it shouldn’t have a huge impact on your trip, however, each year is different. We generally tell people to skip Phuket because it is pretty touristy, but you can still have a nice time there and it is central to island hop on day trips. 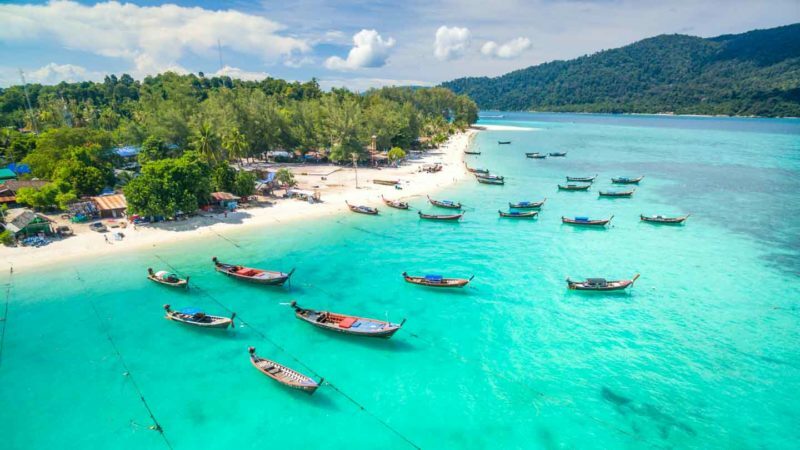 I personally would catch a flight to Phuket (not staying in Phuket) and the island hop down the Andaman coast to Phi Phi, Krabi, Lanta, and Lipe if the ferries are running that far down. I would spend a few nights in each as your time allows. If you are set of going to Samui I wouldn’t let the rain deter you. If it’s going to rain it might rain on either side during that time of the year. safe Travels. Found your blog while trying to research our honeymoon for Argentina and we totally changed our minds to thailand. We are traveling from Philadelphia with dates locked from work to depart Nov 16 and arrive home Nov 28. Your website is amazing and Thailand looks like th perfect place for a good mix of culture, adventure, and relaxation that we were searching for. Do you think the following itinerary is ok? Leave Bangkok on Nov 20th and head to Koh Lipe for 5 nights. Hoping thats not too much in a short time. I would love to get a full two weeks but we are restricted by our jobs. Would there be a better place to end other than Chiang Mai? You certainly seem to love it there especially since you have chosen to live there. Any special logistics we should be aware of to get back home? Hi Kristen, glad to hear you are heading to Thailand for your honeymoon! I think 3 destinations is good for that amount of time. Chiang Mai would be a nice place to finish a trip, there is lots of culture and you can get out of the city and explore a little. Logistically the only thing to worry about is when you are flying home I assume you are going back to Bangkok to catch your international flight, if so and you use an airline like AirAsia you may fly into a different airport than the international flight. Bangkok has two airports BKK (international) and DMK (regional / Airasia). If that’s the case just leave a long enough connection so you can make it across Bangkok (about 1 hour – but very traffic dependent) or if you fly Thai Airways from Chiang Mai to Bangkok the usually land in BKK, but always check which airport before booking. Enjoy your honeymoon! Really Thailand is a nice place and full of natural beauties. The Andaman Sea is dotted with several other beautiful islands like Phi Phi island .. Ferry is the best way to Phi Phi from Krabi. Thailand is amazing, and every time we return we like to explore a new area. Yes the best way to get around the islands is by ferry. Plus the ferries are scenic. Your blog is great & very informative ! We have only traveled through tour company’s and this will be our first trip that we are planning on our own. We are trying to do 2 weeks but besides Bangkok , we are really focusing on island hopping. I love all of your blogs but I am really concerned about transportation from place to place especially with our belongings. I don’t really know where to start so any help would be appreciated ! Hi Nina, Don’t worry Thailand is one the easiest countries to travel, it’s a great place to try a trip without a tour company. If you want to go island to island the Andaman side of the country is probably where you want to be. The gulf of Thailand side has some amazing islands, but fewer of them, but honestly enough for a two week or longer trip. So it comes down to what you want to see or do. We have a post that talks about most of the popular islands to give you an idea of which ones you may want to visit https://www.gettingstamped.com/thailand-island-hopping-guide/ in this post it also has links to book your transport online too. This is great if you want to have everything arranged before you travel, or arranging transport while you are there is super easy and cheap too. Personally if I had two weeks in Thailand I would start with a few nights in Bangkok and then fly to Phuket on the early flight and head straight to the pier and take the ferry to Koh Phi Phi for 3 nights, then ferry to either Koh Lanta or Karbi next for another 3+/- nights, then take the ferry down to Koh Lipe for the rest of the time. Instead of taking the long boat ride back up the islands I would either take the ferry to Langkawi and fly back to Bangkok from there or take the ferry back to Pak Bara pier and fly back to Bangkok from Hat Yai airport. One heads up on your return flight to Bangkok from the islands is if you plan on not staying a night in Bangkok at the end and just catching your flight home is make sure you know which airport you are landing in Bangkok from the islands because there are two BKK (the big international one) and DMK (the smaller domestic one). It’s easy to arrange transport between the airports, but can take 1-2 hours depending on Bangkok traffic so build that into your schedule if needed. Let us know if you have questions as you finalize your Thailand itinerary. Enjoy Thailand! I’ve been to bangkok before (no other part of thailand) but i’m planning to go to Thailand for 2 weeks in November. I actually fly in and out of Phuket. So I’m wondering what 2 week plan do you suggest? I’d love to go to Chiang Mai but looking at google maps it doesn’t seem close. What should I do? Koh Lipe looks nice, but I assume that would be only 3-4 days. Koh Phi Phi which some people talk about is in the opposite direction it looks like. Hi! Great post! For the itenary you recommend….would mid to end of March be a good time for all of the locations? March is a good time but the later into March the hotter it is. In Chiang Mai you may notice it is burning season where they burn the fields and there is a haze on some days. Other than that March is great, especially for the islands. Let us know if you have any other Thailand itinerary questions. Nice informative post.I toured Thailand last July for a month and visited many of the places you mention. I particularly liked Koh Phi Phi because my Thai wife’s cousin lives there and so we got to see what it was like to live with the locals. Bangkok is my favourite city in the world – atmosphere is electric! Bangkok is our favorite city in the world too! I am sure you had an epic time if you have family in Phi Phi. Safe travels. Ohhhhhhh! Just checked our dates, and 22 Heritage is booked. Any other suggestions are appreciated. I love the boutique vibe. Thanks a million. Curious what booking website did you book it with? In that area eat at: The Cat House and Lemongrass! We have had 2 sets of friends stay at 99 Heritage hotel in the old city http://tidd.ly/20e056fb How many days are you in Chiang Mai? I love this thanks for sharing. What would you add for a 3 week trip? 3 weeks I would just spend more time exploring the islands! Is there any Thai dishes that aren’t very spicy. I’m not a big fan of spicy foods but I am planning a trip to Thailand once I graduate to relax and refresh. Most places if you tell them no spice they will make it. Lots of street food vendors have the chilis at the table and you add them yourself. There are tons of Western places to eat if needed (Subway, Mc Donalds, KFC, etc.). What part of Thailand are you visiting? Great blog! Thankyou for sharing!!! How do you get to Koh Lipe? Bangkok a modern metropolis. I am surprised. Nice plan! I love Koh Lanta myself. The Southern half of the island seems similar to Koh Lipe. Paradise! So quiet, pristine waters, amazing food and it’s off the beaten path so very few folks visit. Me and my wife had private beaches almost every day when we took the 35 minute motorbike ride from Old Town. Definitely worth a visit. Haven’t been to Koh Lanta ourselves yet, there are so many Koh’s to explore! We have heard great things about Koh Lanta, so some day we will venture there. Will make sure to rent a bike and explore. Great itinerary!I think this would be a good mix of beaches and relaxation AND culture. Thailand is such a diverse country and has so much to offer! It is always great to find simple itineraries like this. They are exactly how I like to start my travel plans. Thailand isn’t my next stop but it is somewhere I know I will get to one of these days and will be saving this. Will finally be making it to Southeast Asia later this year in Bali. Thanks for sharing. Glad we could help you out and jump start your planning. Hope Thailand is high up on your list, it is one of our favorites. Safe travels!